Stylishly presented in HEVEA’s signature gift box, and colour coded in panda black and white to suit both boys and girls. 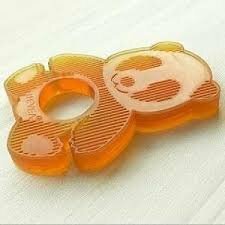 The multiple Award winning HEVEA Panda Teether is made of 100% Pure Natural Rubber and is completely free of plastic and artificial colors. Unlike most other teethers, its one-piece design prevents mold and bacteria from accumulating in cracks and holes making it highly hygeniecal. Easy to clean, just sterilize in boiling water or suitable sterilzing machine. The malleable and soft rubber encourages baby’s natural gnawing action and the gentle textured surface is ideal for soothing and massaging irritated gums, while extremely durable. The cute Panda is easy to fall in love with, and even easier to grab and hold to for tiny hands.